Shanmukhananda Bharatiya Sangeetha Vidyalaya and Natyalaya is an institution about 7 decades old. In the recent past, it has expanded itself by adding new branches in Mumbai in Chembur and Dombivili for Carnatic music (vocal, mridangam, violin and veena), Hindustani music (vocal, sitar, tabla and harmonium) and classical dance (Bharatanatyam). Also it has an outreach examination program through which it extends its facilities by holding exams for external students in the above genres; to students who learn from private teachers and aspire for achievement certificates like the one provided by this institution at end of its 7 year course. The institution had its 4th 'Prathibha Pradarshan' on 10th and 11th August 2018. This cultural program has been initiated to motivate its students towards more enthusiastic learning which rises as they procure a chance to showcase their level of learning to their parents, relatives and friends. 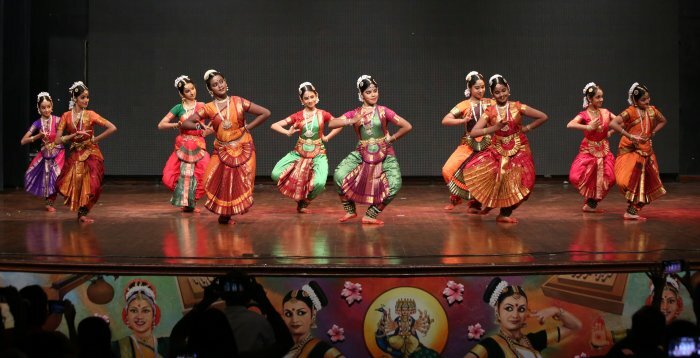 The prathibha pradarshan is applied as a tool to encourage merited children by giving them a platform to get real performance experiences and test one's onstage performance abilities. The parents also get an insight of how the institution is training and encouraging its students, their children's level of skill and about the institution at large. The prathibha pradarshan, meaning "talent show", of the natyalaya section was held on the second day 11th August. They presented pieces from the margam presentation format of Bharatanatyam. The presentation started with a "Ganapathy Vandana" in ragam Nattai and adi talam which was a pushpanjali interspersed with sholkas in praise of Lord Ganapathy. It was a composition and choreography of gurus VP Dhananjayan and Shanta Dhananjayan. It was a group presentation of junior students of the main centre. Students moved from nritta to nritya in an easy manner and feel of bhakti and awe for the one-tusked god was well conveyed. The Dombivili centre performed on a kriti, again on Lord Ganesha, in ragam Gambiranattai set to talam adi. Here Tandava Ganapati was depicted. They presented good group formations and various poses of dancing Ganesha were displayed with agility and lightness. This was followed by a Devi stuthi in ragamalika and talamalika, dramatising the Mahishasuramardini story. It was enacted well. The music for this item, though in Carnatic style, was composed like the Odissi dance ensemble for pallavi. Varnam was a group presentation by senior students of the main centre with choreography by Guru Jyothi Mohan (the former dance teacher of the Natyalaya). Here, the poet Papanasam Sivan likens himself to the nayika and extols praises of Lord Shiva. Stories of Lord Shiva having the poison that arose during churning of the milky ocean and of saving little boy Markandeya from Lord of Death - Yama - was shown in a succinct manner. Jathis, korvais and different formations that sculpted the performance space were a treat to eyes. The Chembur branch then showed their skills with a folk dance by performing the Kavadi Chindu composed by Periyasami Thuran, set in ragam Senchuruti and adi talam in a lively manner. The costume for this item was very aesthetic. Then, the surprise section of the show, faculty members of Natyalaya presented an item each. Their experience and love for their art was seen in their body language. It was a good opportunity for parents and students to watch their gurus perform live on stage. Subha Vittal performed Mata Saraswathi in ragam Kalyani set to adi talam. 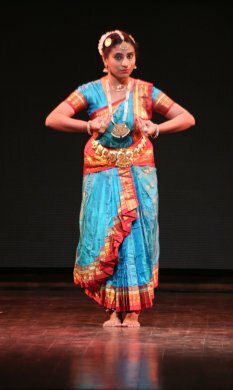 This is a recent composition by a poet Kausalya Raghunandan, choreographed by Guru Jyothi Mohan. A slow song, she was very lyrical in her delineation. A Marathi abhang "Radha rusli madhav rusla" in raag Yamankalyani was performed by Priyal Sontakke where when Radha and Krishna are angry with each other, nature is in chaos. And when Krishna consoles Radha and get united, then pairs of birds and pairs of animals are also happy and together. Choreography of Vaibhav Arekar, Priyal did justice to this abhang. 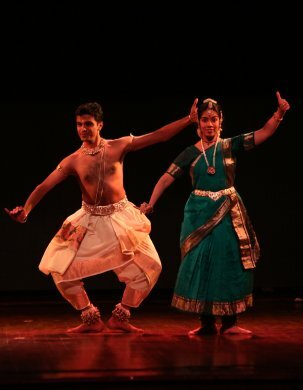 The husband and wife duo of Anand Satchidanand and Jayalakshmi, newly appointed teachers in the main branch, performed the thillana or nrttangaharam as renamed by Guru VP Dhananjayan. They performed a composition of Dr. Balamuralikrishna in ragam Kuntalavarali and talam adi. One could feel the duo to be miniature replicas of the great masters - The Dhananjayans - while watching their performance. The program was short and sweet, about 90 minutes. The beautiful experiences that both parents and students underwent were evident in their happy glowing faces as they left the premises. 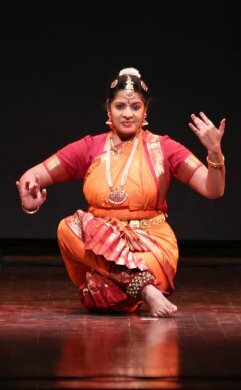 Chandra Anand is a Bharatanatyam artiste and teacher. Apart from having MA in Classical Dance (Bharatanatyam) from Tilak Maharashtra Vidyapeeth, Pune (2014), she has an MA in Eng Lit. from Bombay University (1990) and has done B Ed from Kapila Khandvala College for Education, Santacruz, affiliated to Bombay University (1994).